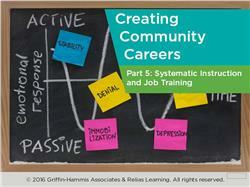 This course is the fifth of a series of five courses based on the work of Griffin-Hammis Associates (GHA.) GHA is working to create better methods and tools to help people find jobs or start their own business through Customized Employment. These courses are designed for professionals involved in employment development for individuals with disabilities, those recovering from mental illnesses or substance abuse issues, and others who face additional challenges beyond unemployment. This course provides techniques for teaching people the skills and routines they need for their new job. The course will cover the effective use of natural on-the-job training. It will provide additional instructional methods when natural training is not enough. These techniques will help to simplify complex jobs so that people with disabilities and other challenges will have a wider array of jobs available to them.